It seems Africans in the Diaspora generally and Nigerians in particular have reached a saturation point where any public event which features high profile African guests or speakers especially public office holders, is regarded with a “so what”, “what’s new” and “haven’t we heard it all before” attitude. 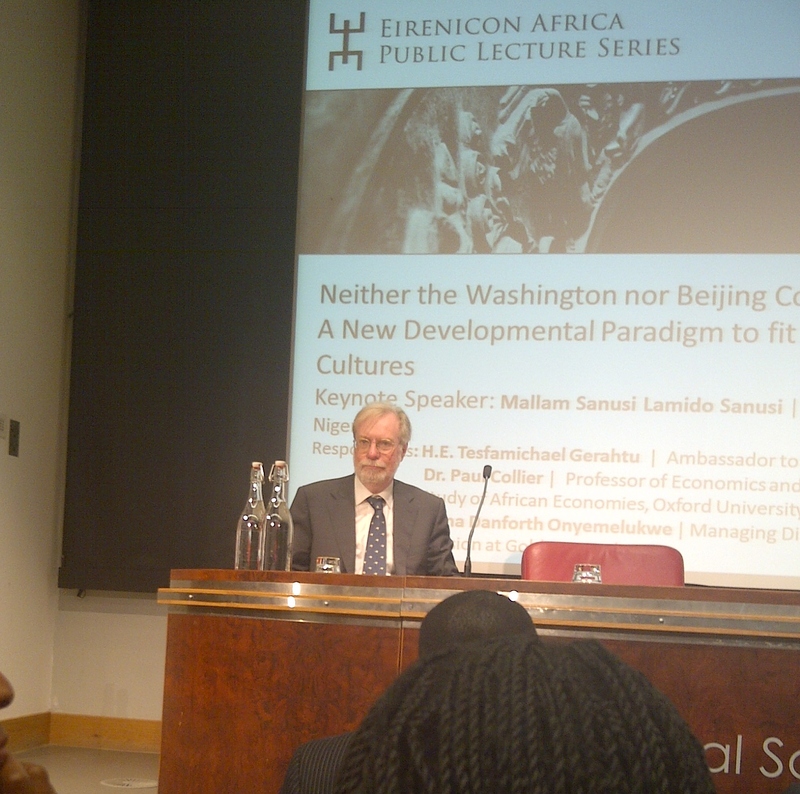 This much was somewhat palpable in the atmosphere at the Eirenicon-Africa Lecture on 27th March 2012 titled “Neither the Washington nor the Beijing Consensus: A New Developmental Paradigm to fit African Realities and Cultures” which, as the title implies, was meant to discuss the way forward for Africa in terms of economic and socio-political development. One can hardly blame those who take this cynical stand point though, given that a number of African policy makers only tend to put on their thinking caps at such public events and put them away once the event is done as they resume “business-as-usual”. However, this event — one of a series of lectures organized by Eirenicon-Africa, a league of established young forward-thinking Africans — and the themes of the discussions focusing on home-grown solutions arguably signal a gradual change from the norm. Mallam Sanusi Lamido Sanusi, the Central Bank of Nigeria (CBN) Governor was the keynote speaker, a fancy term denoting that Sanusi did most of the talking for the duration of the event. Sanusi is a man famous not only for his radical banking reforms, but increasingly for his exceptional oratorical skills because, as the moderator of the gathering accurately described, “…whatever he says is always fascinating”. The two respondents at the Lecture were Ambassador Tesfamicael Gerahtu, the Eritrean Ambassador to the UK and Ireland who exuded tremendous passion and nationalistic fervour for his country – though many an Eritrean activist in the audience held different opinions – and Professor Paul Collier, the distinguished Professor of Economics and Director of the Centre for the Study of African Economies at Oxford University who became (in)famous amongst Nigerians in January this year, for an article he wrote in which he used unsavoury terms to strongly condemn the nation-wide protests against the removal of fuel subsidies in Nigeria. The moderator was China Danforth Onyemelukwe, Managing Director responsible for Africa coverage at Goldman Sachs in London. Each of the speakers took turns outlining what they perceived to be the challenges inhibiting Africa’s development and how they felt Africa could unclasp those fetters. From left to right: Ambassador Gerhatu, Danforth Onyemelukwe and Mallam Sanusi. All three guests seemed to have a problem with the title of the event especially the reference to development models: the Washington and the Beijing Consensus. The CBN governor Sanusi for instance stated that there is nothing like the Beijing Consensus because the Chinese “didn’t go round begging people to adopt their own model” as was the case with the Washington Consensus. Ambassador Gerhatu underscored his aversion to such development models which he regards as “myths rather than reality” because they do not sufficiently capture the diversity in Africa and even within a country like China which he states “doesn’t have one single economic system, but has a diverse system”. Collier was in agreement with Gerhatu’s assessment that development is based on internal dynamics which vary from country to country and little to do with models and ideologies. Sanusi speaking with an economist’s slant pointed to the “structurally deformed” economies in many African countries, with particular reference to Nigeria, and the problem of “value linkages” as the fetters to development. He refers to the Nigerian economy as that which “imports everything we produce and export what we don’t produce… even democracy” referring to how the Nigerian Military government under late General Abacha conducted free and fair elections in Liberia. He added that in Nigeria “we literally consume our GDP” and goes on to cite examples of how Nigerians consume meat from cattle (beef) along with the skin (kpomo, a delicacy), rather than using hides and skins to produce leather. He further stated that no country in the world developed from exporting primary commodities such as crude oil, mineral resources or cash crops — despite the prospects of earning foreign exchange — but that development comes from building the economy and from industrialization. 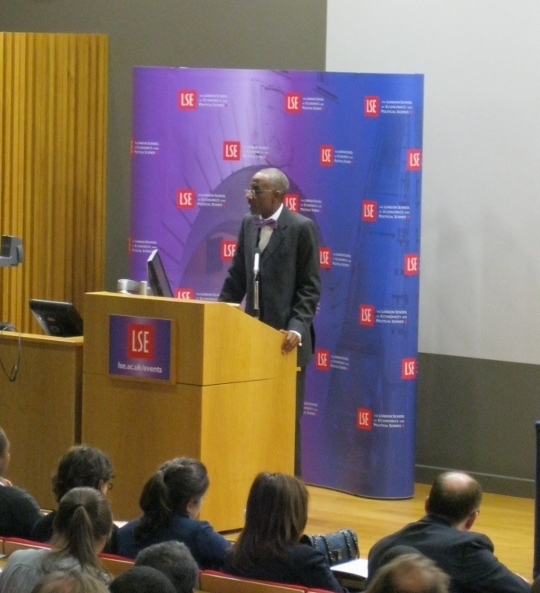 Sanusi at LSE earlier this year. Gerhatu speaking from a socio-political perspective attributed the challenges to development in Africa to that of nation-building, the fact that “nation-building has not been properly consummated in Africa” thus affecting the prospects for creating “viable states, sound economies and a viable future for Africa”. He however placed more emphasis on external factors, the “geo-political influences and world agendas” which have “held back” developing countries and African development in particular, such as the Cold War, the Digital Divide and Globalization. Collier regards the failure of African development as a failure to build a sense of national identity as Gerhatu noted, but rather than attributing these to global geo-political agendas, he blamed the attitude of African political elite, mainly the “plundering of resources” by the political leadership in many resource rich countries. He also underscores the weak institutions and rules in such societies which make it difficult to efficiently harness and manage resources. As was the case with outlining the problems, the speakers differed on some points and converged on others. 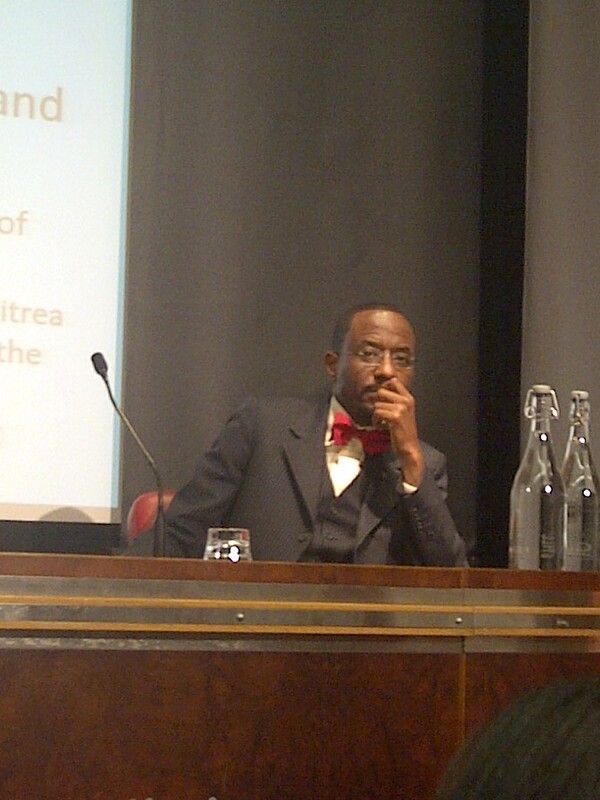 Sanusi advocates for African economies to be built on comparative advantage based on their factor endowments — agriculture and extractive industries for instance — and creation of better value chains within individual economies; a change that regards Africa as the prime market for African countries; greater integration between African countries by building first class infrastructure in Africa which would make African exports competitive against non-African exports on the continent; investing in technical training to make African labour competitive; and importantly encouraging Foreign Direct Investments (FDI) which build productive capacities and discouraging foreign firms which import goods: whether Europe, China or the US he fimly notes, “imperialism is imperialism”. Gerhatu on his own part advocates for “ownership of decisions and solutions for the sake of national interests” by Africans in order to create self reliance and capacity. He also emphasizes on economic liberation by ensuring a paradigm shift from a system of dependence on foreign aid which he regards as “a system of practice, a system of thinking and a system of organization which does not help… NGOs create parallel systems of administration” therefore “we cannot make aid effective”. He referred to Eritrea not only as a country where international NGOs have NOT been active since 1995, but also as an example of successful economic diversification where “agriculture has been the target of structural transformation…” According to the Ambassador, Eritrea’s increased agricultural productivity ensured the country was not affected by the Horn of Africa famine, in his words: “despite what you have heard on CNN, BBC or from the Secretary of State Hilary Clinton” referring to “efforts and conspiracies” aimed at destabilizing Eritrea’s successes in the name of Al-Shabab or Somalia which have been largely unsuccessful. (iii) Existence of a critical mass of citizens who understand why the rules and institutions matter. It was tempting to ask whether this three-pronged process was feasible given that those in authority who will legislate these rules and ensure the institutions work are sometimes not particularly interested in doing so, but thankfully Collier explained that young people in North Africa using technology to coordinate, presented positive prospects as young people in the rest of Africa are waking up to the reality around them. As is usual with such events, some of the most intriguing points were made during the Q & A session. One of the most profound points made was Sanusi’s reflection over the Nigerian fuel subsidy protests in January as comprising of two conversations: the removal of subsidy itself and government accountability. He throws the poser on why it had to take the removal of fuel subsidy to start the conversation on corruption and accountability by ordinary Nigerians and the civil society and why this conversation stopped after the protests. Sanusi indicts civil society in Nigeria of shirking their responsibility in keeping the political elite in check as he believes Nigerian politicians are not more corrupt than those in US or Europe, but that the difference lies in the fact that Americans and Europeans do not tolerate lack of accountability from their leaders. He stresses on the need for those conversations started by Occupy Nigeria to be kept alive by civil society in order to bring about the change Nigerians yearn for. During the event, reference was made to African countries such as Botswana and Ghana which are “working” relative to others which aren’t, so this writer posed a question: that perhaps the reason why countries like Ghana and Botswana are relatively successful is because they are smaller in terms of size and population with relative homogeneity compared to large countries such as Nigeria and Kenya which arguably have been unable to successfully harness and manage their diversity thereby obstructing the process of nation-building and economic development. To this, Sanusi responded by blaming the competition for rent-seeking by the political elite and the failure of the elite to “allow us develop our national identity” in their rent-seeking quests. He advocates for social justice and pursuit of a path even development in order to give everyone a sense of belonging. Lastly, if it is any consolation to Nigerians who were deeply irked by Collier’s op-ed piece, in which he compared the mass protests in Nigeria to the Tea Party movement in America, and referred to Occupy Nigeria protesters as “loudmouths of the street” and “opportunists”, Collier acknowledged receipt of angry emails, the fiercest and most overwhelming feedback he has ever received on any write up. We can smile smugly in satisfaction to that. Overall, one could argue that events such as the Eirenicon-Africa lecture series organized and hosted by up and coming Africans, featuring African decision-makers, discussing home-grown solutions to the challenges bedevilling the continent’s development present bright prospects for the future, and a clean break from the norm, as more Africans are realizing the need to effectively arise and take charge of their destinies. Thank you very much for this. Sanusi was right that it is inexplicable how we missed that particular opportunity to stay focused on the accountability charge. The ongoing probes in the National Assembly, at least two of which are products of the protests, are admittedly encouraging, but when one recalls the fate of previous probes, the hearts have no option but to sink. Of course, the only way is for the civil society to keep talking about it. We know they are disappointed by the ‘backstabbing’ NLC and TUC, but they must not give up. A lot depends on them. Now back to the economics. I think SLS was right by rejecting the term ‘Beijing Consensus’ for the reasons he gave, but rather I think calling it the China Model is appropriate despite Gerhatu’s observations. Prof. Zhang Weiwei has adequately depicted the Chinese Model in his book China Wave and its obvious advantages over the Washington Consensus. His debate with Francis Fukuyama is a most read for anybody interested in the topic these three guests were supposed to have discussed. Purely based on the reporter’s summary of the event, it seemed that rather than discuss the two ‘models’, their merits and demerits, and how they or an amalgam of sorts needed to be arrived at to solve Africa’s problems, the discussants were so overwhelmed that they inadvertently prescribed the Chinese Model. Let me explain, when Jerry Rawlings went to China in the 80s and asked for directions from the Chinese, they, according to Weiwei, told him to study what they are doing and then go back home and increase the local content. Today, we are all using Ghana as a positive example. Clearly the Chinese Model is the preferred given the recent performance (the meltdown) of the economies that were built on the Washington Consensus. It is the right one considering the mutilating effect of these economies on the developing countries occasioned and (according to SLS) ‘aggravated by Washington Consensus policies driven by the US, World Bank and IMF to liberalize trade (free trade), take huge loans, remove subsidies etc.’ That is neo-liberalism at its worst. But now, with the current leadership in Nigeria, which swallows everything American, hook, line and sinker, I wonder how SLS is going to pump the switch down the throat of the GEJ government. At the time Ngozi Okonjo Iwela is being considered for the position of World Bank President, she is not likely going to be happy with the inclinations of the CBN Governor. However, one thing we always admire about SLS, once he is convinced about something, he is never afraid to bare his mind on it no matter whose ox is gored. The hope here is that, on coming back to Nigeria, SLS will call for a review of our national economic and fiscal policies. Let him assemble some eggheads to brainstorm on how Nigeria could borrow heavily from the Chinese Model, take a little from Washington (so as to cut GEJ a little slack) and build in the local content (factor endowment) to arrive at Nigerian economic model. If anybody can do this for Nigeria, SLS can. And now the ball is in his court. I think there are only two models for development that lead to sustained and all-inclusive growth: The Western Model and the East Asian Model. Each model is based on leveraging heavily on the productivity gains of science and technology. The Western model is based on a history of colonialism, exploitation and unfair advantage. We cannot develop like Britain, because we neither have a scientific nor technical advantage over the rest of the World, nor do we have colonies. The East Asian model depends on a highly disciplined, highly regimented population, leveraging on already existing technology and dependence on exports (rapidly moving up the value chain). The first exponents of that model were the Japanese. It then spread to the “Asian Tigers” and now it is spreading to China. We cannot adopt the Chinese model – even if we tried, because we are not a disciplined people by nature. In addition, we are not very good at seeing the big picture or sacrificing the present to secure the future. I think Nigeria is more like India and Brazil – very large nations with large numbers of extremely talented people, yet lacking the discipline to create the institutions required for sustained and all-inclusive growth. (Although Brazil did a lot to reverse inequality under Lula). We should go to India to understand how a nation that suffers from the same bureaucratic bottlenecks as we do, is more ethnically and religiously diverse than we are, has an equally corrupt political class is still able to spawn several World-class corporations and manages a 7% p.a economic growth with a much more balanced economy than China. We learn from India’s mistakes and model our bureaucracy on the Singaporean Civil Service and we craft an optimal solution. We cannot learn much from China – China is a homogenous nation, ruled by an extremely disciplined upper echelon of Communist party cadres with an extremely unbalanced export-dependent economy. Seems to me like you are an expert in this area, which gladdens my heart. Although I must tell you that I am amused by your declaration that there are only two models (Washington and East Asian) on one hand, and your concluding with recommending and ‘Indian Model’! I also think the Chinese will disagree with you that it is the East Asian model that brought them here. Even Fukuyama credits China as the first country to create a modern state. Everything they did, they claimed was homegrown. But that is not the point. What I am seeing from your submission is that you also favour the Chinese (Sorry, East Asian model). I also understand why you think adopting it, again as I said, hook, line and sinker, will not work for us. Even the Chinese think so. That was why I was thinking of the local content component which should encompass our natural and human resources, and of course our ‘unfortunate’ peculiarities that you pointed out. I also agree that learning from the mistakes of others like Brazil and India will really help us. Thank you. Auwal: Interesting points you’ve made there. Despite all that Sanusi (SLS) has said at this Lecture which mostly makes a lot of sense, I think there is only so much he can do, as you suggested, afterall, he is but a CBN governor, not the Minister of Finance or Coordinating Minister of the Economy for instance. Seems like an extremely interesting set of discussions and Lamido Sanusi is an extremely talented and brilliant individual. However, I sincerely wish that Lamido Sanusi spends as much time selling his ideas to the Nigerian people in a language they can understand as he does with a foreign audience. Which brings me to a very important point, Nigeria’s problems will not be solved by foreign based Nigerian intellectuals (I was once one of them, I am back in Nigeria and fully understand the practical difficulties here), foreign scholars (like Collier) or anyone outside Nigeria. They will be solved by Nigerians resident and committed to Nigeria – both common folk and the intellectuals. One of the most important transformational leaders last century was Deng Xiaoping. Deng was able to drive the growth of China by presenting complex thoughts as simple statements like “cross the river by feeling for the stones” (i.e. we will try several theories and adopt the ones that best suit our circumstances. “To get rich is glorious” (i.e. capitalism is not a bad system – very important after the ravages of Mao) and “it doesn’t matter whether the cat is black or white, all that matters is that it catches mice” (i.e. we will be guided by pragmatism). Ideology in Nigerian politics died with Aminu Kano. Aminu Kano was a person who could communicate the way he thought the World should work to even the most simple of folk. He was extremely successful at doing so. Now back to Sanusi. Sanusi has a lot of wonderful ideas, but he hasn’t made enough attempt to sell them to common Nigerian folk. Nigeria’s history will be written by that rare intellectual – an intellectual with a honest heart, but who makes the effort to communicate his thoughts in the simplest of language. A person who understands the language of the streets. How I wish Sanusi could convey these same thoughts in Hausa and Pidgin English! Could Sanusi please hold similar sessions with business folk in Onitsha, Aba, Kano, Lagos and Ibadan? Many of the people in those towns don’t speak English as well as we do, but they are much smarter than we are – he will leave with a lot of practical wisdom. Will he be prepared to host periodic sessions with inter-state yam merchants, tomato sellers and cattle herders (these groups all deal with large volumes of cash but are extremely unsophisticated) in Lagos Island about their thoughts on innovations such as “cashless policy”? He would be an even better Central Bank governor if he did. Thank you for this. I think we will achieve a lot that way. Chike: I have to say I completely agree with you here. The onus now lies on brilliant individuals like Sanusi to communicate and effectively convey such “transformational” ideas to the ordinary Nigerians on the street, to the ordinary traders, merchants, business men and women who hardly have the opportunity of attending such events/conferences, so that such ideas ultimately have a meaningful impact. There is a huge communication gap between policy makers and ordinary members of the public which needs to be closed. The massive disconnect between the educated professional classes and the masses really gets me worried. On the other hand, most politicians understand the language of the masses (Obasanjo, IBB, Ibori etc). They really know how to talk to them, to get their attention. We don’t seem to care. Once we write sophisticated articles or presently extremely well argued positions, we assume the job is done. It isn’t. 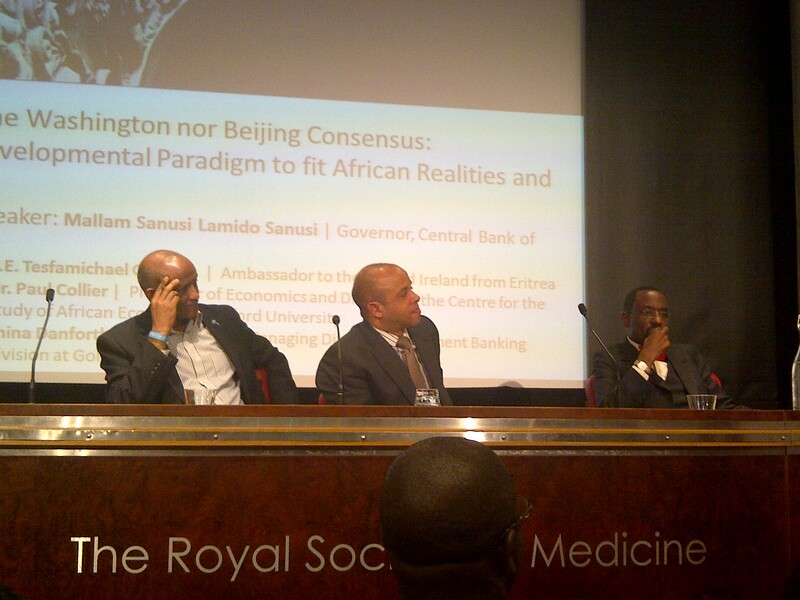 It is suprising to learn that Sunusi Lamido Sunusi denied the knowledge of Beijing consensus. Second, not shedding more light on Washington consensus arguments of for and against; especially on ten prescription of economy on developing countries designed by Professor John Williamson of Washington. I share the same view with Beijing consensus, which specifically said every country should take its own path for economic development. Therefore, Sunusi LLamido Sunusi should read more especially on global political economy. This is PARADOXICALLY interesting to see the CBN governor pointing out the the gross errors of subsidy removal on social services by Africa’s governments at this international conference Abroad, while endorsing the same harsh economic model at Home vis-a-vis the Nigeria’s government scam called fuel subsidy removal…. I think if you re-read the report, you’ll see that Sanusi still stands against subsidizing consumption but he is all for subsidizing production. I think there is no conflict there. Is a subsidy on petroleum products a subsidy on consumption? Not entirely true. We don’t only produce goods, we produce services. The barber that uses a small generator is producing a service and removing the subsidy on pms hampers his ability to efficiently produce that service. The same applies to the hairdresser, the woman who grinds cassava and the achaba rider – they all produce services and they all depend heavily on petrol powered generators. Is it possible to make a distinction between petrol earmarked for production of services and petrol earmarked for consumption? No. What exactly does consumption and subsidising consumption mean? When I drive my car to work every morning is the fuel I burn part of the cost of delivering a service to my clients or simply “consumption”? If we were to take that argument a bit further, what about the production of goods? At this point in time production of goods in Nigeria heavily depends on the cost and availability of diesel. When the subsidy on diesel was removed, there was a massive flight of manufacturers out of Nigeria. Dunlop left, and anyone who has visited Kano understands this better than I do. So Sanusi isn’t actually being consistent here. I am of the view that Nigeria still needs a subsidy on petroleum products. The costs of the subsidy regime are amplified by massive incompetence and corruption. Virtually all our imported products come through a single jetty at Apapa and the procedures governing shipment inspection and distribution of these products are extremely inefficient and prone to misuse. Nigeria’s problem isn’t a subsidy problem but a process efficieny problem. If the government cannot solve the problems of process inefficiency, then why let the masses bear the brunt of the pain? Zee!very educative sesion with SLS and the other two erudite prof.
Jst like to re-afarm on the saying of prof.colin that ‘imperialism is imperialism’ because julius Nyarere has ever posit that a ‘a parasite is a parasite whether he live on water or blood is a parasite,a parasite is one who exploited our economy’therefore also noted the tips for way forward as mention in the lecture for Africa development. Hajiya zainab my your pen keep moving…i like it! This is a reply to Chike. I could not find any ‘reply’ link below your very important comment. I was trying to explain SLS’s position. When SLS mentions subsidizing consumption, he is talking about the point at which the subsidy is being made – pre or post-production. From the examples he has been giving, you’ll notice that his position and perspective has not changed. But the justification for the removal of subsidy on oil is a different matter all together. By the way, I am convinced that there is a lot to learn from your vast experience out there and back home. At this critical moment in our nation’s history, we must harness all credible resources we can lay our hands on. And this very much includes you. I’d therefore appreciate it if you could send me your contacts (email preferably) to aanwar_z@yahoo.com. Thanks and God bless. Sanusi isn’t a text book economist, he has actually run a bank. So I tend to judge him a little bit more harshly than I would judge a former economics professor. Think about it, telecom providers in Nigeria spend more than $300 million a year on purchasing diesel. Nigeria isn’t Britain where an efficient public transportation system already exists. The British government can heavily tax the usage of petrol to encourage patronage of an already existing and heavily subsidised public transportation system. The United States on the other hand, does not have an efficient public transportation network, so petrol consumption is not as heavily taxed. A liter of gasoline in the US costs about $ 0.77, while in Nigeria the cost is about $ 0.65. Nigeria has a gdp per capita of a few thousand dollars, while America’s gdp per capita is more than $40,000. Considering the economic theory of “comparative advantage” and the fact that Nigerians depend more heavily on the availability of gasoline to run their businesses, how far exactly, can we afford to go on the removal of fuel subsidies? Theoritically interesting. Zainab, El-rufai and Malam Sanusi should always remember and bring to action the speech of Late Ahmadu Bello, the Premier of Northern Nigeria that “Independence (present day reforms) should wait until the country (northern nigeria) has enough resources (education and wealth) to support and make the success of independence ! Please substitute “Northern Nigeria” with “Nigeria”.